Panteleymonova house captures you with its functionality, space and style. 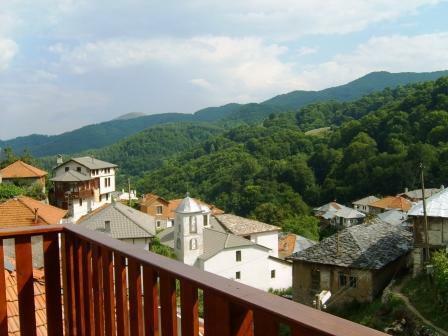 The house is situated in the pearl of the Pirin mountains-Delchevo village. The house harmoniously blends the traditional Bulgarian revival architecture with comfort and style which will satisfy even the most demanding taste. The combination of wood and stone gives the feeling of comfort and homely cosiness and allows for a real authentic experience of well-being,prosperity and inner satisfaction.The house has two storeys,barbecue area and a private garage.On the first floor there is a spacious tavern with a fireplace,fully-equipped kitchen and bathroom and toilet.On the second floor there are three bedrooms;one with two twin beds,one with a double bed and one with a king-size bed and a single bed. On this floor there is also a toilet and a bathroom with a bathtub and a balcony with a capturing view over the picturesque village and the centenarian forest.At the barbeque area outside you can enjoy the fresh mountain air in the cool evenings.Whatever is the occasion of your visit here you will be charmed by Panteleymonova house.Welcome!